Make no mistake: “Island hopping” is not a term limited to Greece or South East Asia. China’s very own Guangdong province is home to clusters of tropical islands that are well worth a visit, especially in the summer months when a fresh sea breeze and blue sea is exactly what the doctor would order. This article introduces six beautiful islands off the coast of Guangdong that offer the perfect summer escape from Guangzhou. To get to the following destinations, we advise you to hire a car or driver as they are not all conveniently reached using public transportation – but trust us, the extra effort will be worth it. Zhuhai is nicknamed the “the city of a hundred islands” for good reason. Some 30 miles off the coast lie over 150 islands, making up the Wanshan Archipelago. This cluster of islands include well known tourist destinations such as Dong’ao Island, Guishan Island, Wailingding Island and many more. Wailingding in particular offers stunning vistas of the surrounding emerald sea and is the only island among the bunch that offers views of Hong Kong’s outlying territories. Meanwhile, Dong’ao is renowned for its dense vegetation coverage and fine white sands. These two islands may enjoy the brunt of publicity, but some of the other outlying islands are also worth exploring. Wailingding is famous for its “three treasure” seafood which consists of sea urchin (海胆), goose barnacles (狗爪螺) and a dish made of abalone (将军帽). Fans of seafood should definitely give these a try! There are plenty of amenities, shops and accommodation options on Wailingding, but visitors may also consider camping near the beach (weather permitting of course). Getting there: take a bullet train from Guangzhou South Railway Station to Zhuhai (takes about an hour). From Zhuhai, take bus no. 11 or 56 to Xiangzhougang stop (香洲港). From there, walk to the Xiangzhou Passenger Port (珠海香洲岛海港客运码头) which offers boat rides to the Wanshan Islands. Located by the southern part of Yangjiang City in the South China Sea, Hailing Island (海陵岛) is well-known for its beautiful scenery. The best way to fully appreciate the island is to circumvent the coastline from the island’s east to south to southwest – it’s along this 20 kilometer coastal stretch where you’ll find 12 of the most stunning natural, white beaches. As such, it should come as no surprise that Hailing is a popular destination for couples seeking a romantic getaway. Besides enjoying its pristine beaches, the island is also home to a number of temples and a “Chrystal Palace” museum dedicated to the historic Silk Road. A word of caution is necessary however: this being China, home to 1.3 billion people, the charms and allure of Hailing have not gone unnoticed. During the peak summer season, beaches here can attract as many as 100,000 visitors so if you’re not prepared to feel like a sardine in a can, you may want to consider going elsewhere. One of the specialties on this island is shrimp pancake and seafood barbeque; give these a try if you visit. The island has numerous hotels that are conveniently located along the coast and apartments are also available for renting. The more adventurous can also opt to camp out under the stars. Yangjiang doesn’t have a train station so the only way to get here using public transport is taking a bus there from Guangdong Provincial Bus Station. The journey should take around 3.5 hours. Once you get to Yangjiang you’ll have to take another bus to Zhapo (闸坡). Ever dream of diving in a blue, calm sea, admiring beautiful coral reef and watching the fascinating underwater world pass you by? Some may be surprised to hear that Fangji Island (放鸡岛) is home to one of Asia’s largest diving centers and is one of the country’s top spots for snorkeling. The beach area is congested with no less than seven amusement areas so if it’s peace and calm that you’re after, we recommend spending your time underwater while here. One of the biggest underwater attractions – besides the high visibility of the water itself – is a mysterious dark cave where a notorious pirate is believed to have hidden his treasures during ancient times. Fangji Island is also a major fishing base; the fish here are said to be so plentiful that even amateurs will be able to enjoy a catch. Peak tourism season is from May to August so be prepared for crowds if you travel here during this time. There are plenty of accommodation options in Maoming City to cater to all wallet sizes including a 5-star wooden house resort, luxury and sea-view hotels and budget hostels. Donghai Island may not be the most beautiful island in the country in terms of beaches and blue skies, but it is renowned for its stunning sunrise and sunsets. In addition, Longhaitian beach is the longest in China and second longest in the world (supposedly) at 28 kilometers long and 150-300 meters wide. The seafood here is not only fresh out of the sea, it’s also very reasonable in price. Grilled oysters are a must-have while here. The island is not far from Zhanjiang City so some people opt to stay the night in the city for convenience. However, you’re going to miss out on the sunsets and sunrises as well as the island charm if you choose to stay in the city. The island itself has plenty of hotels to choose from, ranging from expensive luxury ones to small guest houses. These two islands belong to Taishan City, 14 km offshore in the South China Sea. Shangchuan Island is the largest island in Guangdong province and is known as the place of death of St. Francis Xavier. It was also one of the first bases established by the Portuguese during their colonial expedition in south China. Nowadays, both islands are peppered with small fishing villages and one of the best experiences is to befriend some of the local fishermen and spend a couple of hours out at sea with them on a fishing expedition. But if you’re Chinese is not up to scratch there are plenty of other ways to experience the charms of these islands. Shangchuan is celebrated for its fine sands and crystal clear waters. The most famous beaches are the Flying Beach (飞沙滩), Silver Beach (金沙滩) and Golden Beach (银沙滩). At the Flying Beach, visitors can avail of fun water amusements including water scooters and parachuting. The other two beaches have less commercial amusements and are more suited to those who just want to embrace nature. The sea surrounding Shangchuan and Xiachuan is not polluted so seafood served on the island is fresh and clean. There’s no shortage of accommodation on the islands but the most authentic experience is staying in a fisherman’s guest room. Getting there: From Guangdong Provincial Bus Station (广东省汽车客运站) take a bus to Taishan City (台山); this trip will take 1.5-2 hours. From there, take a local cab or mini-van to the islands. Located in Dayawan District in Huizhou City, Sanmen Island is one of the best preserved ecological islands in China. Despite its close proximity to the touristy Dapeng Peninsula, the island has not been spoiled by tourism, largely due to the fact that it was once a military island off-limits to the public. The island covers an area of around 5 square kilometers and has a coastline of about 13 kilometers. 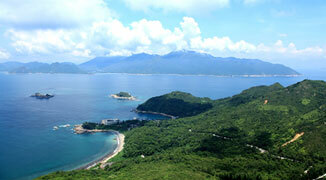 The most beautiful and idyllic part of the island is found at Moon Bay and Baisha Beach. The beaches here have fine, white sands and clear blue waters with visibility of 10-20 meters. The island has designated areas for diving and it is also possible to hire a yacht with a personal captain. The island also has a 300-meter high peak called Haishishanmeng Peak that offers breathtaking views of the surrounding islands. Getting there: the island is easy to reach from Shenzhen. From Shenzhen’s Futian Bus Station take the “Lvyou Zhuanxian” line (旅游专线) to Danpeng; alternatively you can take bus no. E11 from Yinhu Bus Station (银湖汽车站) to Nan’ao. Once at Dapeng or Nan’ao take the M232 to Xichong and from there take a boat to the island. The boat trip only takes around 5 minutes. To Wanshan Islands, do you take the train to Zhuhai North or Zhuhai Gongbei? Really nice article. I will definitely look into visiting these beaches. Thanks!